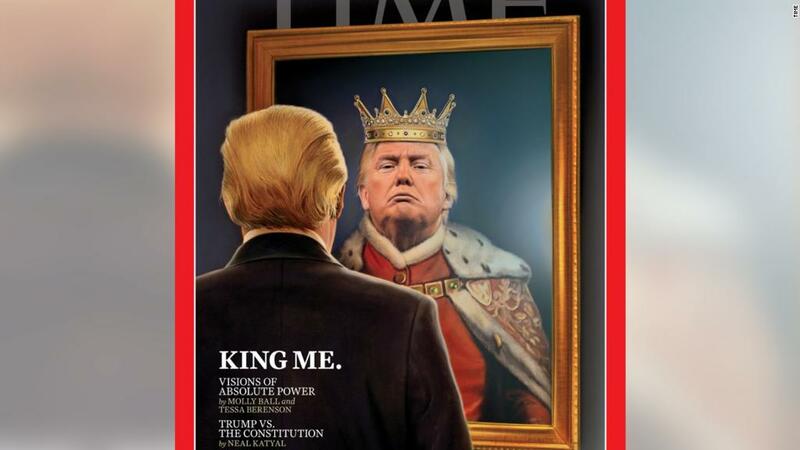 The latest Time magazine cover features an illustration of President Donald Trump gazing at a reflection of himself in which he's dressed up as a monarch, complete with jeweled crown and fur cape. The picture is accompanied by the text: "KING ME." In a piece about the cover posted online Thursday, Time said that it's meant to address "the political attacks launched by the White House on Robert Mueller." Mueller is the special counsel appointed to investigate potential meddling by Russia in the 2016 presidential election. It's long been a sore spot for the president. Trump has repeatedly called the probe a "witch hunt." This week, Trump also referred to the investigation as "unconstitutional" and insisted that he can pardon himself. "As has been stated by numerous legal scholars, I have the absolute right to PARDON myself, but why would I do that when I have done nothing wrong?" Trump wrote on Twitter Monday. Time's cover illustration is the work of Brooklyn artist Tim O'Brien. His work has appeared on more than two dozen issues of Time dating back to 1989, "with subjects ranging from Pope Benedict XVI to Osama Bin Laden," the magazine said. He told the publication that the latest cover image "gets to the heart of how he and his legal team have approached this past week and the past 500 days, actually." O'Brien told the magazine that his biggest decision with this illustration was "whether or not to have him looking at himself or looking at us," O'Brien said. "His eye contact with each reader, each American fits the situation best." This marks O'Brien's fourth Time cover depicting Trump since he took office last year. Two of those covers show the president seated behind his Oval Office desk as he's hammered by wind and rain.